We have owned a lot for several years. We are ready to buy a new home but should we build on the lot or buy an existing new home? People you know would have different experiences and opinions to share. There are differences in these options that depend on your circumstances. Here is information to help you compare. Reader Question: We bought a lot several years ago to build a home, and we are now ready to go forward. I have gathered some general information, but I’d like to have more of a general idea before we decide between buy new existing home or build from scratch? . Where can I find information and advice on the building process? The home site – setting grade elevations, excavating for utilities and footings for the foundation and basement walls. 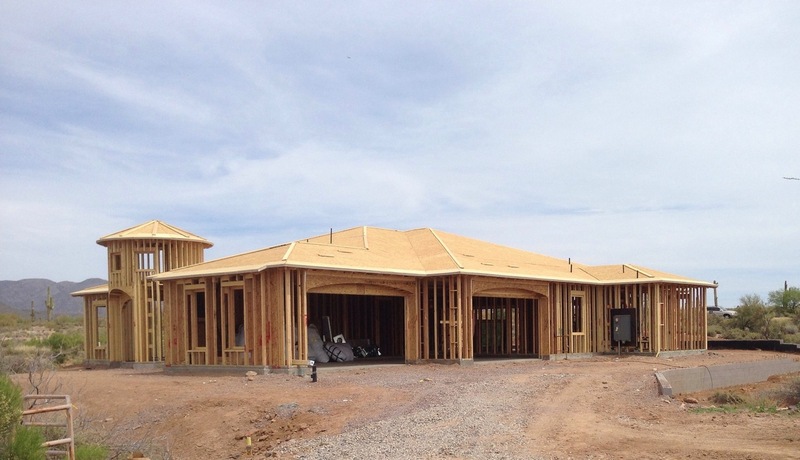 Construct the shell – assemble the floor deck, frame the exterior and interior walls, install roof trusses and plywood sheeting. Rough-in mechanical components – plumbing, electrical, plus heating, ventilating, air conditioning ducts (HVAC) and cable or sound system wiring. Install insulation – Deck sill, exterior walls, ceilings, garage and other sections, such as basement walls, interior rooms, etcetera. Install sheetrock – finish interior walls with dry wall or plaster textures. Paint or paper walls, install windows and apply exterior finishes. Install hard-surface flooring – wood, ceramic, and vinyl, plus countertops, and slope the soil grade away from the foundation. Finish mechanical work – electric breaker box, furnace, air conditioning and condenser (HVAC) and registers, sinks, toilets and faucets, and light fixtures, outlets and switches are all installed or completed. Install shower doors, mirrors, and finish flooring (carpeting), and finish exterior landscaping like grass or sod, trees, and shrubs. Walkthrough with the builder – the tour results in the creation of a “punch list” where you observe nicks, scratches, cracks, chips, and other minor issues. All the operational components are explained and tested to ensure they function correctly. Buying a newly completed home. Someone beside yourself has made most of the decisions for you. Choosing the floor plan, the building materials, the fixtures, countertops, cupboard design and finish, door style, window style and more, are no longer needed. The work and time were necessary but done by others. For some consumers this is an advantage, for others, it is a disadvantage. Virtually every component in a new home comes in varying levels of quality. Someone else determined the quality level for you. The incorporation of materials in a home comes with many choices. Shingles can last for between twenty and fifty years. The cost rises at each step. Lumber comes from different species of trees and in different grades. The Janka test rates wood for hardness. There are many cases where a utility grade two-by-four will perform just as well as a higher quality one. Others have judged each component. For some consumers this is an advantage, for others, it is a disadvantage. You save time when you buy an existing new home. You spend no time shopping for components, or identifying and interviewing contractors, plus, the time from the decision to purchase and to physical occupancy is far shorter when the product is “on the shelf.” You will have to spend time comparing builders and subdivision locations, but that time is minimal when compared to building from scratch. Again, some consumers want to save time, and others enjoy the education and the challenge of maintaining control over the entire project. The cost savings of avoiding a construction loan may produce lower closing costs and interest rate.